Home > Archives > Coast Starlight/Daylight led by E9A locomotive No. 418, 1970s. This image is similar to one used on an Amtrak postcard, and is likely one of a set taken to highlight the Coast Daylight/Starlight. The service operated from 1971-1974 and was one of the first to run almost the full length of the West Coast. At its endpoints, connecting trains offered service to San Diego and Vancouver, B.C. 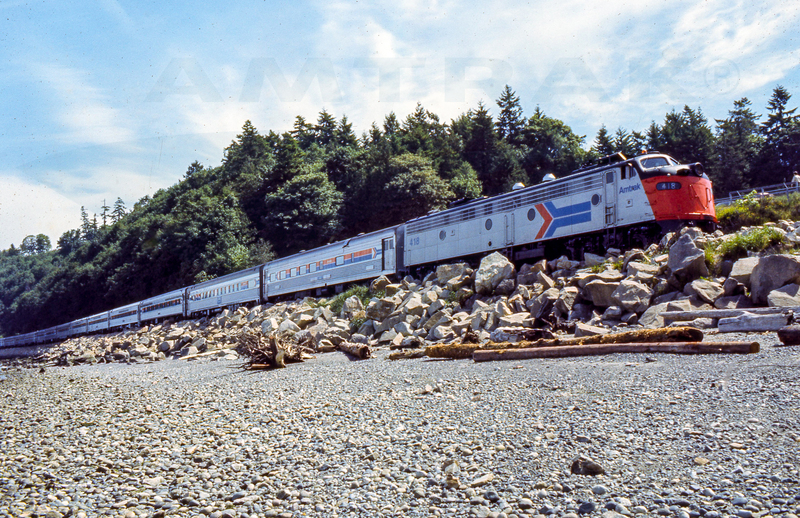 In spring 1974, the route became known simply as the Coast Starlight, and remains so today. EMD E9A locomotive No. 418 leads the train and wears the first Amtrak paint scheme introduced in 1972. Built by General Motors' Electro-Motive Division, this locomotive was originally owned by Union Pacific Railroad but was turned over to Amtrak when it took over the nation's intercity passenger rail services. Making up the consist are a variety of single level dining, lounge, sleeping and coach cars that were purchased or leased from the predecessor railroads. Photographer: Unknown for Amtrak. From the Amtrak Corporate Collection (Marketing Library).